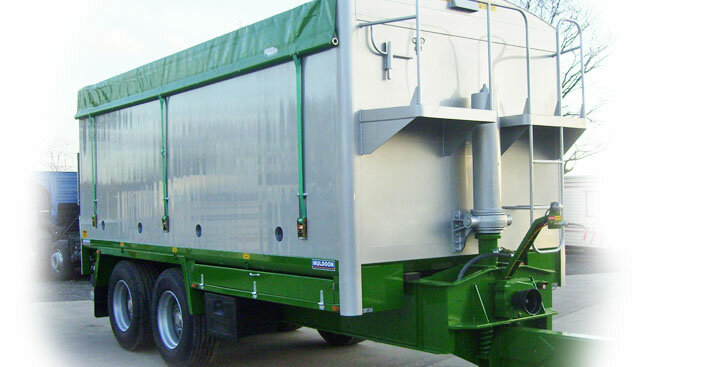 The Muldoon TRACTOR OPERATED AGRI BULK BLOWING TRAILER is a convenient and economical way of transporting animal feeds using an agricultural tractor or a fast-track machine. This system dramatically reduces transport costs, as it elimates the need for a HGV, HGV driver, high insurance and all the other high running and maintenance costs associated with HGV’s. The operation can run solely on agricultural diesel. 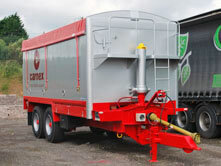 The blowing equipment is driven via the PTO on the tracor and works along the same principle as a HGV blowing vehicle. 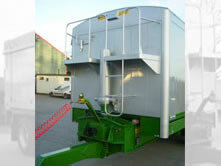 Trailers can be supplied in a range of capacities up to 14 tonnes and can be divided into multiple compartments. The minimal size and compact nature of the trailer allows for easy manoeuvrability and access to small places. 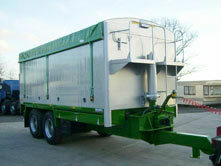 Features include high speed road axles, air brakes, roll-over cover, windows and grain hatch. The trailer comes with 12 months warranty.